I always delight in sharing with you my many “Aha!” moments. One I had this week came while strolling through my mental art collection, pondering the element of positive and negative space and the principle of approximate symmetry. I particularly like introducing you to an artist who has an interesting background story, or, who played a pivotal role in some way in art history. Bertha E. Jaques fills the bill. It is interesting to me that many written histories of women artists gloss over those who were graphic artists. That is a shame because there were many fascinating women who specialized in printmaking. And I’m particularly partial to artists from the Midwest where I was born and raised. The so-called “revival” of etching— in other words, etching as a stand-alone art form rather than as a way of copying paintings—is often cited as having begun in the 1860s with the founding of the Society of Etchers in France. Although some American artists had used etching as early as the 18th century, nothing really came of the medium until 1866 when a French artist visited the US armed with etching supplies and examples of prints from “revivalist” etchers in Europe. In 1877 the New York Etching Club was founded. In 1892, Chicagoans were introduced to etchings from European artists at the Chicago Columbian Exposition. Printmaking in Chicago (and the Midwest) at the time was predominantly lithography and wood engraving. Bertha Jaques was born in Ohio and lived in Iowa. She studied painting. She did not come to printmaking until she went to the Columbian Exposition, impressed by the etchings she saw of French artists. She subsequently bought a copper plate from a hardware store, as well as wax, pitch, and nitric acid. Her first tool was an old dentist’s drill. Her physician husband helped her make etching equipment from surgical instruments. 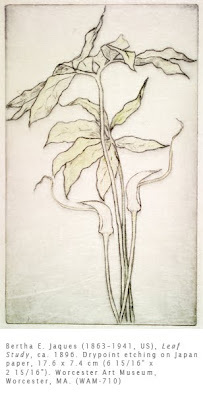 She then bought a press in Milwaukee, and in 1897 produced some of the first etchings in the Midwest. Jaques founded the Chicago Society of Etchers, an organization that disseminated at least 40,000 prints across the Midwest, popularizing the medium of etching. Landscape and botanical prints dominate Jaques’ oeuvre, many of which, like this example, she hand colored. Although she produced over 400 etchings and drypoints, none were produced in large editions. She was more of an advocate for the medium, and as such, she is in my Hall of Fame of artists from the Midwest.